A lot of women write to me about being introverted and the problems that entail. They go out with their friends to clubs and bars. Their friends are having the time of their life and meeting quality guys, yet they are stuck in the corner sipping an overpriced cocktail and not receiving the same attention. Finding love is a harrowing journey and a public venue like a bar or club are jungles of distractions that do more to hinder than help, at times. These women are high-quality and have many redeeming qualities, yet they are struggling to meet men in public places, in a non-internet dating context. In our Western culture, men are the ones that typically have to approach a woman in this scenario. This is often terrifying for men and they will often suffer from varying degrees of "approach anxiety". However, this also presents a dilemma for the women who are shy. In many ways, it takes the control away from women. So where do they make inroads? The answer is simple as it is effective. Even if you are shy, you can give off body language that is warm and inviting. The famous UCLA body language study yielded that 93% of all communication is non-verbal. This is not very surprising, as language was the last form of communication that humans evolved. We are hard-wired to decipher the body language of others first and above all else. If someone looks to be threatening or closed off, our natural biological reaction is to avoid them. In our male minds, we can't distinguish an attitude from a girl who may simply be quiet and more reserved. This technique very much works in your favor due to how visually oriented we are as males. Give off those signals that make it as easy as possibly for a guy to approach you. When an attractive guy catches your attention, smile, create eye contact, give him every reason to approach you. Second, and this cannot be understated, logistics plays a vital role. You will probably want to separate yourself from your friends for a period of time. Again, approaching a woman at a bar is scary enough, but a group of them is even more terrifying. Make the logistics as easy as humanly possible for you and the guy. A good idea is to purposely walk by him in close proximity on your way to the restroom. Additionally, you can wait for him to go to the bar to order a drink and go stand next to him to order yours. Reducing the physical barrier to communication is as important as your body language. The more you actually label yourself as "shy" the more it becomes a self-fulfilling prophecy. As is the case with lifestyle-building, it will take some work on your end, but the results will be soon to follow. Next time you are out with them, study how your outgoing girlfriends carry themselves. Ask them about what works and what doesn't. As men, we have to take the scary leap to approach. However, we don't know the difference between shy and shutoff. 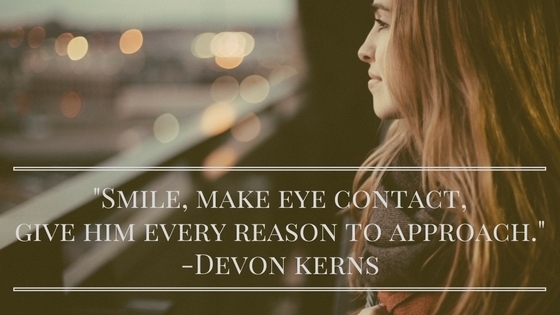 If you are having trouble attracting the guy that interests you, smile, make plenty of eye contact and give him them every reason to approach. In the ideal situation, both parties will shoulder equal responsibility and be conducive toward a positive interaction. Go out with a willingness to have new experiences. Many times, shyness is simply encapsulated by fear. Whereas vulnerability is and always will be very attractive.